Located about 30km away from Ceske Budejovice, Èeský Krumlov is one of One of Bohemia's most beautiful towns, a compulsory stop in your visit to South Bohemia. In 1992 the town was rewarded for its historic importance and physical beauty with a place on the UNESCO's World Heritage list. Krumlov is a living gallery of elegant Renaissance-era buildings housing charming cafes, pubs, restaurants, shops, and galleries. The main tourist attraction is the Krumlov Castle, the second castle complex after Prague's Hradèany castle. Krumlov Castle contains a preserved Baroque theatre, complete with original stage machinery, scenery and props: one of only a few such theatres that still exist. 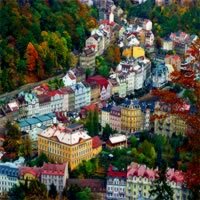 Karlovy Vary, also known in English as Carlsbad, is a spa city situated in Bohemia, the western part of the Czech Republic. It is historically famous for its hot springs (13 main springs of which the largest, best known and most popular esplanade is Mill Colonnade, about 300 smaller springs, and the warm-water Teplá River). In the 19th century, it became a popular tourist destination, especially for international celebrities visiting for spa treatment. The city is also known for the Karlovy Vary International Film Festival and the popular Czech liqueur Karlovarská Becherovka. The glass manufacturer Moser Glass is located in Carlsbad. The second largest city in the Czech Republic, Brno is the metropolis of Moravia and an important tourist centre for all who want to explore the natural and cultural beauties of the South-Moravian region. Empire and neoclassical buildings abound. The main tourist sights are: the Brno Dragon and the Wagon Wheel. Spilberk Castle and the Gothic cathedral of Saints Peter and Paul give historical perspective to this town. Villa Tugendhat, a unique example of modern functionalistic architecture, built in the late 1920s, was designated a World Heritage Site by UNESCO in 2002. The city also offers many possibilities of cultural enjoyment in its numerous theatres, museums, cinemas and clubs. Dating back from 1265, this fortress town became one of Bohemia's wealthiest and most important towns. Ceské Budejovice is an architecturally stunning place.The old town preserves interesting Medieval and Baroque architecture around the large town square, including the old town hall, and the town tower "Èerná vìž" ("Black Tower"). In the new town the Belle Epoque Austro-Hungarian train station is notable. The most valuable historical building in Èeské Budìjovice is Dominican convent with gothic church Presentation of Virgin Mary on Piaristic square. Set among the breathtaking natural scenes of the Czech mountains, Marianske Lazne is an elegant Neo-Classical and Art-Noveau spa town with excellent climatic conditions. The top attractions of the town are its 100 mineral springs (53 of them are tapped) with high carbon dioxide content and often also higher iron content, both in the town itself and its surroundings. Most of them are orderly kept and often pavilions and/or colonnades are built around them. The guest lists present celebrity names like: Goethe, Chopin, Wagner, Anton Bruckner, Johan Straus, Henrik Ibsen, Franz Kafka, Fridrich Nietzsche, and many others. Edward VII, King of England, came back nine times. 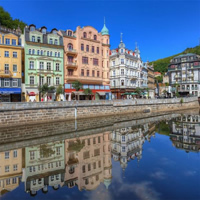 Karlovy Vary, also known in English as Carlsbad, is a spa city situated in Bohemia, the western part of the Czech Republic. It is historically famous for its hot springs (13 main springs of which the largest, best known and most popular esplanade is Mill Colonnade, plus about 300 smaller springs, and the warm-water Teplá River). In the 19th century, it became a popular tourist destination, especially for international celebrities visiting for spa treatment. 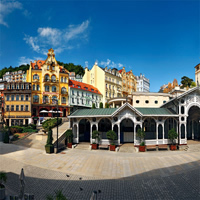 The city is also known for the Karlovy Vary International Film Festival and the popular Czech liqueur Karlovarská Becherovka. The glass manufacturer Moser Glass is located in Carlsbad. Set forth on an adventure like never before, seeing two of Czech Republic`s cherished cities. Start Prague(The City of a Hundred Spires` with 1,000 years of art and architecture) then take a train to Karlovy Vary(Situated in the western area of the Bohemia region) and then take a train back to Prague. Transportation between cities is by rental car. This is a flexible vacation package. Select your number of nights in each city, desired hotel and activities. Czech republic is offering three of its most unforgettable cities in this customizable package. Begin this adventure in Prague(The City of a Hundred Spires` with 1,000 years of art and architecture) then drive to Ceskey Kumlov(Nestled in the South Bohemia region of the Czech Republic, overflowing with is historical buildings and landmarks), then to Karlovy Vary(Situated in the western area of the Bohemia region) and then drive back to Prague. Transportation between cities is by rental car. This is a flexible vacation package. Select your number of nights in each city, desired hotel and activities.